When a half-demon baby puts Mackenzie Solomon’s life—and her job as a demon hunter—on the line, she can’t turn her back on the half-pint of evil. But ‘Junior’ is actually part of a trap to turn Mackenzie’s partner, Josh, and his extraordinary charming skills to the dark uses of the ancient, fallen Grigori, the angels once assigned to be Watchers over humanity. Is she going to have to make a choice about the men in her life? Josh learned months ago that the bad blood in his demon hunting partner brings out a part of he can’t control—including his desire for her. With a prophecy out on him, he’s more than a little worried some of those bad things should stay buried. But is Mackenzie really the start of something bad—or could she be everyone’s salvation. 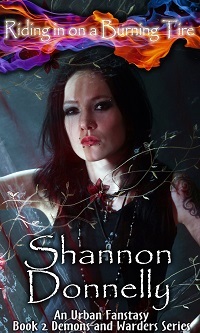 Mackenzie Solomon is on the edge of going “dark” and losing her warder license if she gets any more evil on her. However, she’s also the only one who can stop an early Armageddon. And nothing has stopped the bad ideas… or the itch for action. That’s starting to cause a rift with her former charming partner, Josh. He’s been tainted by demon blood, so is he now one of the bad things she now needs to avoid? Because Josh may be responsible for the Endowment’s Magi going “Houdini” on everyone. With Josh going rogue to find out what he’s been charmed not to remember, Mackenzie is given a choice by the Endowment—bring him in and maybe the Magi will help them both. She’s not sure she trusts the offer—and she’s not sure she can trust Josh. But it’s not demons or the undead that are her main worry. “Rapturists,” led by the charismatic and supernaturally seductive Isra Gilz, are out to take down the Endowment and kick-off the end of days. With tainted tats Isra has turned Mackenzie’s younger brother into his inside man on this plan—and Mackenzie may have to take them both out to stop Armageddon. On the other side of the Rift—the blackness that separates dimensional realities—a world exists, but just barely. Edge Walkers—things made of energy that feed off electrical impulses—have feed too long off this world. Now they’re looking for new feeding grounds. New bodies to take over and animate into the walking dead. And scientist Carrie Brody accidentally opens a doorway to Earth. Stuck on the wrong side of that door in a deadly world, Carrie’s only help is a man, Gideon Chant, who also slipped over to this world. But while Gideon is willing to help her to a point, he’s also a man with his own agenda and the weight of a secret. He has given up on a future for himself to correct a mistake from his past. Can Carrie fix her own mistakes and put the Walkers back into the Rift for god? Or will those fixes cost her Gideon—or perhaps even her life? Under the Kissing Bough and Lady Scandal are stand alone books — although I do keep thinking about other characters in those stories. I got the Compromise Books and the Proper books…unfortunately read them out of order. I might just start them all over again. You have gained a new Fan Ms. Donnelly…Thank you for transporting me to another place and time each night! I read Lady Scandal on my Kindle and at the end it mentions a follow-up book “including the tale of Diana and her captain.” What is the title of that book, I am not finding it. That book is going to be called “The Captain’s Lady” and it’s one I’m currently working on — look for it out by end of this year. Thank you for creating such interesting characters and situations! I just read Lady Scandal and look forward to reading about Diana and her captain, also would enjoy reading about Jules (he seems like he could be a surprising character under what seemed to be a easy going personality in the epilogue). Do you plan a story for him? Yes, Jules has a lot going on under the surface, and he’s going to meet someone who shakes him out of his defenses. I’ve been reading your Demons and Warders series and I love it! 🙂 I’m wondering when the third book “angels Don’t Burn” will be available. So glad you’ve been enjoying. Angels Don’t Burn should be out this fall.